Wayne originally from Australia is now based in the UK. 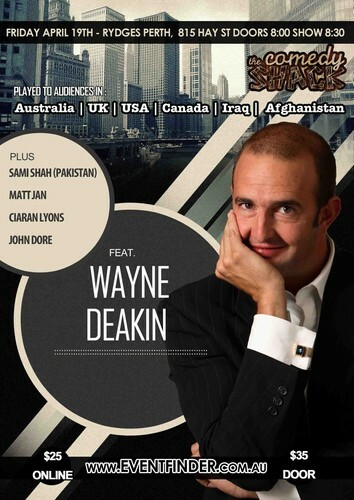 A regular headliner at all Australian comedy venues, Wayne also tours constantly throughout the USA and Canada. Currently based in London, he works the Comedy Store, Jongleurs and Glee Clubs as well as touring Asia, the Middle East and the Isle of Man. As well as his solo Melbourne Comedy Festival shows, His New York tours included consecutive nights at Carolines, New Yorks premier comedy venue and headlining New York Improv. Performing at the Montreal Comedy Festival and doing a week as MC at the world famous Laff Trax in Las Vegas are current career highlights. Wayne also performed in front of 14,000 people at the 2004 and 2006 Meredith Music Festival and 24,000 at 2005 The Falls Festival. Wayne also tours with the Australian Defence Forces and British Army in East Timor, Sinai, Cyprus and various tours of the Middle East. In 2007 Wayne toured Iraq and Afghanistan doing gigs for the diggers. As scary as it was edifying. it remains one of the best things Wayne has ever been involved in. Wayne starred in and produced Channel 31’s highest ever rating show, Tiger TV and can be seen on the Comedy Channel show “Stand Up Australia” and the American reality show “Last Comic Standing”. Wayne is also known as ‘Deaks’ performing weekly on the top rating “Hughsey & Kate” breakfast show on Nova 100 in Melbourne. Along with Wayne will be a all star cast of comics your host for the night is Sami Shah (Pakistan) aswell as Matt Jan, John Dore and Ciaran Lyons. Come down a little earlier after work with you group and enjoy a meal at the CBD Bar & Restaurant at the Rydges Hotel - choose from the extensive food and beverage menu, something fresh and delicious to tantalize your taste buds. A smaller menu is available for the show and a bar during the show. Online: $25 Door $35 book 6 or more tickets at the same time we will secure a table for your group. Door sales cash only and a strictly limited. Tickets selling fast so secure your seat by booking online.